Poke is a unique two-player game that combines the mechanics of a trick-taking game with that of poker. In the first part of the hand, players draw cards to make the strongest poker hand they can. In the second, they play those hands out in the style of a classic trick-taking game. Poke was created by the American game collector, inventor, and author Sid Sackson, perhaps best known for his classic board game Acquire. The rules of Poke were first published in Esquire magazine in 1946, and it was later included in Sackson’s 1969 book A Gamut of Games. The object of Poke is to score points by forming good poker hands and collecting tricks. Shuffle and deal five cards to each player. The rest of the deck becomes the stock. The non-dealer acts first. They examine their hand, hoping to have a hand that is strong both as poker hand and at trick-taking. With this in mind, they decide whether they wish to discard any cards. If they do, they may discard up to three cards, and are dealt replacements from the stock. However, drawing doubles the player; any tricks the dealer captures will count double at the end of the hand. If the player is still not satisfied with their hand, they may discard a second time, and doing so redoubles them, making their opponent’s tricks count quadruple. Should a player choose to simply stand pat, they incur no penalty and are not doubled or redoubled. After the non-dealer finalizes their hand, the dealer has the chance to draw cards. Unlike the non-dealer, the dealer’s first draw is free; they are not penalized for choosing not to stand pat. The dealer also has the option to double and redouble themselves by drawing a second and third time. The non-dealer leads any card they wish to the first trick. The dealer responds by playing any card from their hand. Whoever played the higher card wins the trick. Unlike in most trick-taking games, suits are wholly irrelevant to trick play; there is not even a requirement to follow suit. In the event of a tie, the player who led to the trick wins it. After a trick has been played, leave it on the table, keeping it clear who played which card. When a player wins a trick, they lead to the next one. If a player has a pair in their hand, they may lead both cards at once. This effectively leads to two tricks at the same time. Their opponent can only beat this type of lead by playing a higher pair; if they cannot, they may play any two cards and lose both tricks. 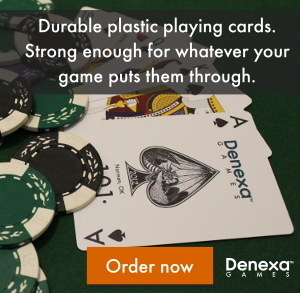 Likewise, a player holding three or four of a kind may lead the whole set at once, and their opponent can only beat them if they have a higher-ranking set with the appropriate number of cards. After all five tricks have been played, each player counts up the number of tricks they have won. 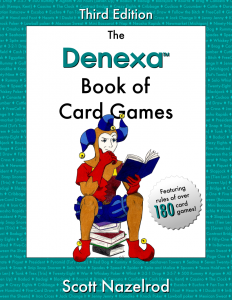 If a player’s opponent was not doubled or redoubled, each trick the player captured scores one point. If the opponent was doubled, each trick is worth two points; with a redoubled opponent, each trick is worth four points. These points are recorded below the horizontal line on the scoresheet. This honor score is recorded above the line. If a player takes in all five tricks on a hand, they score a 250-point bonus, also recorded above the line. After the hand is scored, the non-dealer collects the cards, shuffles, and deals the next hand. Game play continues until one player reaches 20 or more points below the line, ending the first game. This player scores a 100-point bonus above the line for winning the first game. (If both players tie at 20 or more points below the line, it is ignored until further game play breaks the tie.) The scores below the line are then zeroed out, and another game is played. When a player wins two games, a rubber is completed. The player ending the rubber scores the usual game bonus, plus a 500-point rubber bonus above the line if their opponent won a game, or a 750-point bonus if they didn’t. The scores above the line are then totaled, and whichever player has the higher score is the winner.